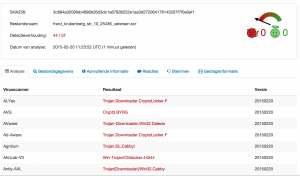 I uploaded the scr file to Virustotal for further analysis. So far (22-Feb) no-one else submitted a similar sample. 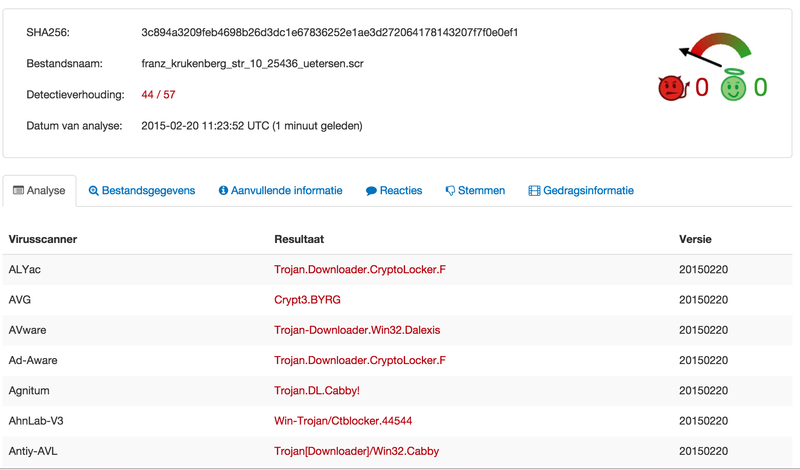 According to Virustotal the file gets recognized by most anti-virus vendors as a CryptoLocker virus. Trojan.Cryptolocker.F is a Trojan horse that encrypts files on the compromised computer and then prompts the user to purchase a key in order to decrypt them. CryptoLocker is known as ransomware. The timing in the post by F-Secure describing a rise in CTB-Locker infections corresponds with the time the e-mail was received. The certcli.dll file is a Microsoft DLL that provides communications between a client or intermediary application and certificate services. The WTSAPI32.dll file is a Microsoft DLL that contains the application programming interface (API) functions that enable application programs to (1) manage terminal services, (2) set and retrieve user configuration information that is specific to terminal services, (3) use terminal services virtual channels, and more, in a terminal services environment. 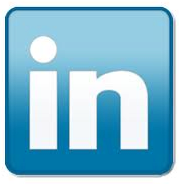 The SHLWAPI.dll is a Microsoft DLL that is a library which contains functions for UNC and URL paths, registry entries, and color settings. 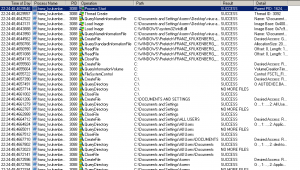 The file cmpbk32.dll is a Microsoft DLL file which is responsible for a component to Microsoft Connection Manager Phonebook. 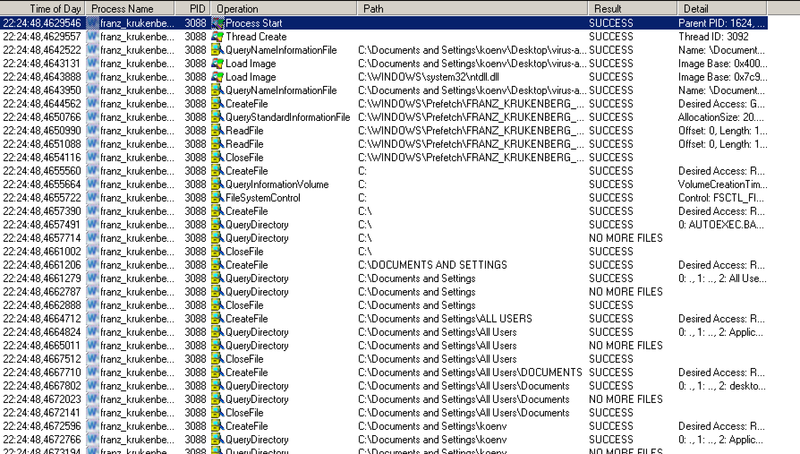 Strings also revealed the use of a library ddi32.dll. As far as I could verify this is a library that helps with drawing. 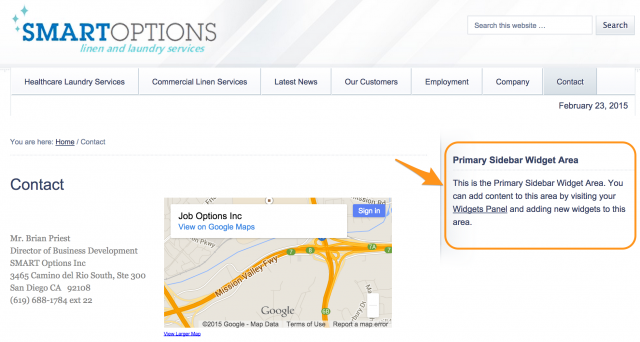 It’s most probably used to build up the notice for the end user that they have a “problem”. 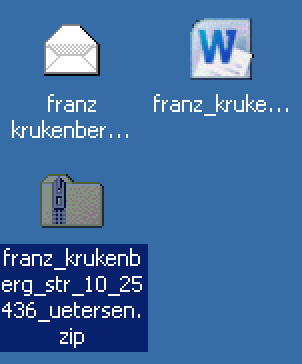 When I copied the files to a Windows machine I immediately noticed that the icon of the file mimics to be a Word document. 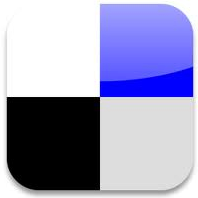 This is done to lure the user into opening the file. 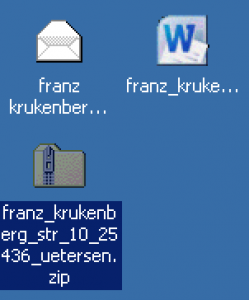 I then decided to execute the file in a virtual machine, a Microsoft Windows XP-SP2. The first step would be to execute it in a VM without external network connectivity. I captured all the network traffic with /Applications/VMware Fusion.app/Contents/Library/vmnet-sniffer in a pcap file. 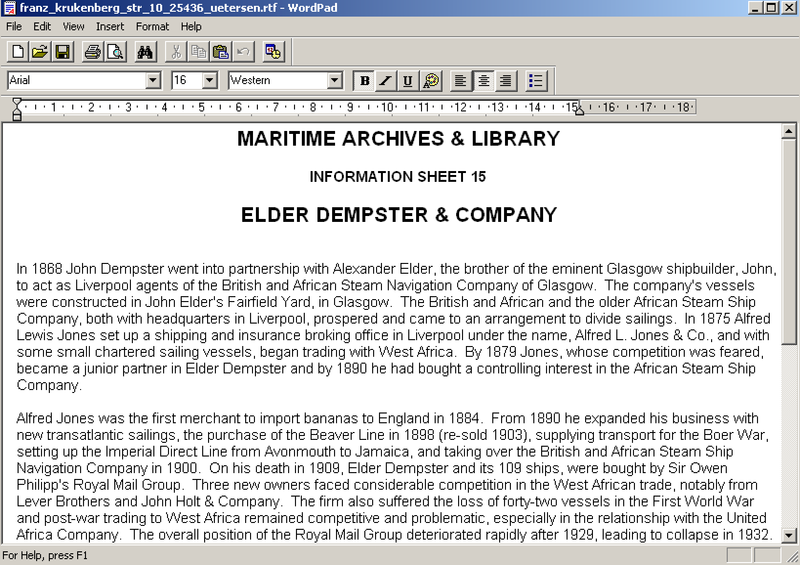 Opening the file reveals indeed a Word document with the title MARITIME ARCHIVES & LIBRARY Information Sheet 15 ELDER DEMPSTER & COMPANY. 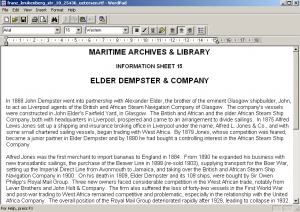 This is a document from the National Museums of Liverpool in the United Kingdom. After opening the Word document nothing seems to happen. I did not see any network activity at first. After closing the document there was a process that kept running in the background. It took a couple of minutes before I could see any “unusual” network requests. Although Dshell from the US Army provides an easy interface for tracking network activity in a pcap file I decided to use tshark to brush up my knowledge on tshark expressions. There are only two obvious ways network connections from basic malware can happen. Either it connects directly to a hardcoded list of IPs or it does a DNS lookup for a list of hardcoded domains. When I looked at the pcap data I could not see any connections to “unsual” IPs. So I ran tshark against the pcap file to extract the DNS requests and sort them. Note that on some Linux flavors you have to use -R instead of -Y. This resulted in a number of domains mostly involving normal Windows operations. Some of the domains however had nothing to do with the network behavior of a normal Windows computer. 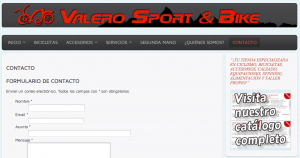 In this case the domains bikeceuta.com, cargol.cat, ppc.cba.pl and smartoptionsinc.com are queried several times. According to Symantec, the CryptoLocker virus downloads its message from a number of command and control servers. I assumed that the domains bikeceuta.com, cargol.cat, ppc.cba.pl and smartoptionsinc.com were used by this version of CryptoLocker to download its additional information. The domains are listed in a number of malware analysis by Sophos : Troj/Agent-ALLW and Troj/Agent-ALMD. The detection date is in line with the date the infected e-mail was received. The domain bikeceuta.com is registered to somone in Spain. At the time of writing, it resolved to 91.142.215.77. This is an IP in Spain. 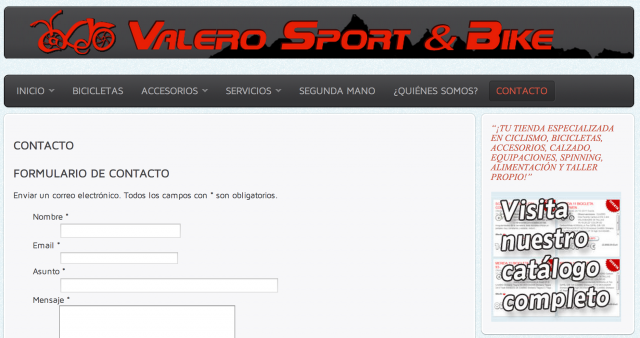 The website of bikeceuta.com returns a page (in Spanish) of a sports bicycle vendor. The domain cargol.cat is registered to somone in Spain. At the time of writing, it resolved to 217.149.7.213. This is an IP in Spain. It’s no longer possible to access the website at cargol.cat. You now get a 403 “You don’t have permission to access / on this server.” message. 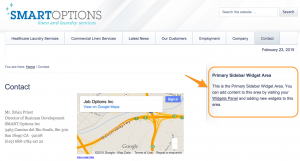 The domain ppc.cba.pl is registered via a registrar in Belize. At the time of writing, it resolved to 95.211.144.65. This is an IP in Holland (belonging to Leaseweb). The webserver of ppc.cba.pl now returns a page with “Page is blocked”. This is a good indication the hoster is aware of the problem. Out of these four domains, the Polish domain (ppc.cba.pl) has whois data that has been recently updated. Similar to the information in the e-mail headers there are sources in different countries. My experiment so far described how this version of CryptoLocker works. I prevented it from actually starting what it is supposed to do by blocking the network access. The next steps involve having it run in a fully networked environment and observe what happens. Blocking the network access to the command and control servers does not prevent CryptoLocker from starting but it prevents it from doing direct harm to your documents. This is a good reason for having a network setup that blocks outgoing connections to blacklisted domains. Everything depends of course on the quality of the blacklist. It certainly is not a perfect solution but an extra layer of defense. Also note that some malware checks if it’s being run in a virtualization environment. This was not the case for this sample which made it easier for me to do the analysis. If you only consider the geographical location and language then the source of this malware could be something Spanish or Central America based. This is highly speculative and it could also be rather a coincidence. Two command and control servers are located in Spain and registered with a Spanish or Catalonian TLD. The registration of one command and control server is in Belize (Central America). The sender IP is in Mexico. One of the IPs of a command and control server is in California (near Mexico). The last part of this post describes the behavior of this virus an a networked VM. Thanks for this interesting blog! Wonder if you could send me the pcap you captured using vmnet-sniffer. Appreciate it. Hi Jin. Thank you for the feedback. Unfortunately I no longer have the pcap file in my possession.